The Punic Wars were a series of three wars fought between Rome and Carthage from 264 BC to 146 BC. At the time, they were some of the largest wars that had ever taken place. The term Punic comes from the Latin word Punicus (or Poenicus), meaning "Carthaginian", with reference to the Carthaginians' Phoenician ancestry. The main cause of the Punic Wars was the conflicts of interest between the existing Carthaginian Empire and the expanding Roman Republic. The Romans were initially interested in expansion via Sicily (which at that time was a cultural melting pot), part of which lay under Carthaginian control. At the start of the First Punic War (264–241 BC), Carthage was the dominant power of the Western Mediterranean, with an extensive maritime empire. Rome was a rapidly ascending power in Italy, but it lacked the naval power of Carthage. The Second Punic War (218–201 BC) witnessed Hannibal's crossing of the Alps in 218 BC, followed by a prolonged but ultimately failed campaign of Carthage's Hannibal in mainland Italy. By the end of the Third Punic War (149–146 BC), after more than a hundred years and the loss of many hundreds of thousands of soldiers from both sides, Rome had conquered Carthage's empire, completely destroyed the city, and became the most powerful state of the Western Mediterranean. With the end of the Macedonian Wars – which ran concurrently with the Punic Wars – and the defeat of the Seleucid King Antiochus III the Great in the Roman–Seleucid War (Treaty of Apamea, 188 BC) in the eastern sea, Rome emerged as the dominant Mediterranean power and one of the most powerful cities in classical antiquity. The Roman victories over Carthage in these wars gave Rome a preeminent status it would retain until the 5th century AD. During the mid-3rd century BC, Carthage was a large city located on the coast of modern Tunisia. Founded by the Phoenicians in the mid-9th century BC, it was a powerful thalassocratic city-state with a vast commercial network. Of the great city-states in the western Mediterranean, only Rome rivaled it in power, wealth, and population. While Carthage's navy was the largest in the ancient world at the time, it did not maintain a large, permanent, standing army. Instead, Carthage relied mostly on mercenaries, especially the indigenous Numidians, to fight its wars. These mercenaries were primarily led by officers who were Carthaginian citizens. The Carthaginians were famed for their abilities as sailors, and many Carthaginians from the lower classes served in their navy, which provided them with a stable income and career. In 200 BC, the Roman Republic had gained control of the Italian peninsula south of the Po River. Unlike Carthage, Rome had a large and disciplined army, but lacked a navy at the start of the First Punic War. This left the Romans at a disadvantage until the construction of large fleets during the war. The First Punic War (264–241 BC) was fought partly on land in Sicily and Africa, but was largely a naval war. It began as a local conflict in Sicily between Hiero II of Syracuse and the Mamertines of Messina. The Mamertines enlisted the aid of the Carthaginian navy, and subsequently betrayed them by entreating the Roman Senate for aid against Carthage. The Romans sent a garrison to secure Messina, so the outraged Carthaginians then lent aid to Syracuse. Tensions quickly escalated into a full-scale war between Carthage and Rome for the control of Sicily. After a harsh defeat at the Battle of Agrigentum in 262 BC, the Carthaginian leadership resolved to avoid further direct land-based engagements with the powerful Roman legions, and concentrate on the sea where they believed Carthage's large navy had the advantage. Initially the Carthaginian navy prevailed. In 260 BC, they defeated the fledgling Roman navy at the Battle of the Lipari Islands. Rome responded by drastically expanding its navy in a very short time. Within two months, the Romans had a fleet of over one hundred warships. Aware that they could not defeat the Carthaginians in traditional ramming combat, the Romans used the corvus, an assault bridge, to leverage their superior infantry. The hinged bridge would be swung down onto enemy vessels with a sharp spike to secure the two ships together. Roman legionaries could then board and capture Carthaginian ships. This innovative Roman tactic reduced the Carthaginian navy's advantage in ship-to-ship engagements. However, the corvus was also cumbersome and dangerous, and was eventually phased out as the Roman navy became more experienced and tactically proficient. Save for the disastrous defeat at the Battle of Tunis in Africa, and the early naval defeats, the First Punic War was a nearly unbroken string of Roman victories. In 241 BC, Carthage signed a peace treaty under the terms of which they evacuated Sicily and paid Rome a large war indemnity. The long war was costly to both powers, but Carthage was more seriously destabilized. According to Polybius, there had been several trade agreements between Rome and Carthage, even a mutual alliance against king Pyrrhus of Epirus. 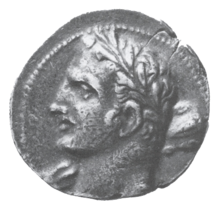 When Rome and Carthage made peace in 241 BC, Rome secured the release of all 8,000 prisoners of war without ransom and, furthermore, received a considerable amount of silver as a war indemnity. However, Carthage refused to deliver to Rome the Roman deserters serving among their troops. A first issue for dispute was that the initial treaty, agreed upon by Hamilcar Barca and the Roman commander in Sicily, had a clause stipulating that the Roman popular assembly had to accept the treaty in order for it to be valid. The assembly not only rejected the treaty but increased the indemnity Carthage had to pay. Carthage had a liquidity problem and attempted to gain financial help from Egypt, a mutual ally of Rome and Carthage, but failed. This resulted in delay of payments owed to the mercenary troops that had served Carthage in Sicily, leading to a climate of mutual mistrust and, finally, a revolt supported by the Libyan natives, known as the Mercenary War (240–238 BC). During this war, Rome and Syracuse both aided Carthage, although traders from Italy seem to have done business with the insurgents. Some of them were caught and punished by Carthage, aggravating the political climate, which had started to improve in recognition of the old alliance and treaties. During the uprising in the Punic mainland, the mercenary troops in Corsica and Sardinia toppled Punic rule and briefly established their own, but were expelled by a native uprising. After securing aid from Rome, the exiled mercenaries then regained authority on the island of Sicily. For several years, a brutal campaign was fought to quell the insurgent natives. Like many Sicilians, they would ultimately rise again in support of Carthage during the Second Punic War. Eventually, Rome annexed Corsica and Sardinia by revisiting the terms of the treaty that ended the first Punic War. As Carthage was under siege and engaged in a difficult civil war, they grudgingly accepted the loss of these islands and the subsequent Roman conditions for ongoing peace, which also increased the war indemnity levied against Carthage after the first Punic War. This eventually plunged relations between the two powers to a new low point. After Carthage emerged victorious from the Mercenary War there were two opposing factions: the reformist party was led by Hamilcar Barca while the other, more conservative, faction was represented by Hanno the Great and the old Carthaginian aristocracy. Hamilcar had led the initial Carthaginian peace negotiations and was blamed for the clause that allowed the Roman popular assembly to increase the war indemnity and annex Corsica and Sardinia, but his superlative generalship was instrumental in enabling Carthage to ultimately quell the mercenary uprising, ironically fought against many of the same mercenary troops he had trained. Hamilcar ultimately left Carthage for the Iberian peninsula where he captured rich silver mines and subdued many tribes who fortified his army with levies of native troops. Hanno had lost many elephants and soldiers when he became complacent after a victory in the Mercenary War. Further, when he and Hamilcar were supreme commanders of Carthage's field armies, the soldiers had supported Hamilcar when his and Hamilcar's personalities clashed. On the other hand, he was responsible for the greatest territorial expansion of Carthage's hinterland during his rule as strategus and wanted to continue such expansion. However, the Numidian king of the relevant area was now a son-in-law of Hamilcar and had supported Carthage during a crucial moment in the Mercenary War. While Hamilcar was able to obtain the resources for his aim, the Numidians in the Atlas Mountains were not conquered, like Hanno suggested, but became vassals of Carthage. The Iberian conquest was begun by Hamilcar Barca and his other son-in-law, Hasdrubal the Fair, who ruled relatively independently of Carthage and signed the Ebro Treaty with Rome. Hamilcar died in battle in 228 BC. Around this time, Hasdrubal became Carthaginian commander in Iberia (229 BC). He maintained this post for some eight years until 221 BC. Soon the Romans became aware of a burgeoning alliance between Carthage and the Celts of the Po river valley in northern Italy. The latter were amassing forces to invade Italy, presumably with Carthaginian backing. Thus, the Romans preemptively invaded the Po region in 225 BC. By 220 BC, the Romans had annexed the area as Gallia Cisalpina. Hasdrubal was assassinated around the same time (221 BC), bringing Hannibal to the fore. It seems that, having apparently dealt with the threat of a Gallo-Carthaginian invasion of Italy (and perhaps with the original Carthaginian commander killed), the Romans lulled themselves into a false sense of security. Thus, Hannibal took the Romans by surprise a mere two years later (218 BC) by merely reviving and adapting the original Gallo-Carthaginian invasion plan of his brother-in-law Hasdrubal. After Hasdrubal's assassination by a Celtic assassin, Hamilcar's young sons took over, with Hannibal becoming the strategus of Iberia, although this decision was not undisputed in Carthage. The output of the Iberian silver mines allowed for the financing of a standing army and the payment of the war indemnity to Rome. The mines also served as a tool for political influence, creating a faction in Carthage's magistrate that was called the Barcino. In 219 BC, Hannibal attacked the town of Saguntum, which stood under the special protection of Rome. According to Roman tradition, Hannibal had been made to swear by his father never to be a friend of Rome, and he certainly did not take a conciliatory attitude when the Romans berated him for crossing the river Iberus (Ebro), which Carthage was bound by treaty not to cross. Hannibal did not cross the Ebro River (Saguntum was near modern Valencia – well south of the river) in arms, and the Saguntines provoked his attack by attacking their neighboring tribes who were Carthaginian protectorates and by massacring pro-Punic factions in their city. Rome had no legal protection pact with any tribe south of the Ebro River. Nonetheless, they asked Carthage to hand Hannibal over, and when the Carthaginian oligarchy refused, Rome declared war on Carthage. The Second Punic War (218–201 BC) is most remembered for the Carthaginian general Hannibal's crossing of the Alps. His army invaded Italy from the north and resoundingly defeated the Roman army in several battles, but never achieved the ultimate goal of causing a political break between Rome and its allies. While fighting Hannibal in Italy, Hispania, and Sicily, Rome simultaneously fought against Macedon in the First Macedonian War. Eventually, the war was taken to Africa, where Carthage was defeated at the Battle of Zama (201 BC)  by Scipio Africanus. The end of the war saw Carthage's control reduced to only the city itself. There were three military theaters in this war: Italy, where Hannibal defeated the Roman legions repeatedly; Hispania, where Hasdrubal, a younger brother of Hannibal, defended the Carthaginian colonial cities with mixed success until eventually retreating into Italy; and Sicily, where the Romans held military supremacy. 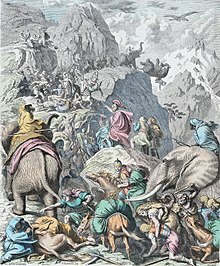 After assaulting Saguntum in Hispania (219 BC), Hannibal attacked Italy in 218 BC by leading the Iberians and three dozen elephants through the Alps. Although Hannibal surprised the Romans and thoroughly beat them on the battlefields of Italy, he lost his only siege engines and most of his elephants to the cold temperatures and icy mountain paths. In the end he could defeat the Romans in the field, but not in the strategically crucial city of Rome itself, thus leaving him unable to win the war. Hannibal defeated the Roman legions in several major engagements, including the Battle of the Trebia (December 218 BC), the Battle of Lake Trasimene (217 BC) and most famously the Battle of Cannae (216 BC), but his long-term strategy failed. Lacking siege engines and sufficient manpower to take the city of Rome itself, he had planned to turn the Italian allies against Rome and to starve the city out through a siege. However, with the exception of a few of the southern city-states, the majority of the Roman allies remained loyal and continued to fight alongside Rome, despite Hannibal's near-invincible seeming army devastating the Italian countryside. Rome also exhibited an impressive ability to draft army after army of conscripts after each crushing defeat by Hannibal, allowing them to recover from the defeats at Cannae and elsewhere and to keep Hannibal cut off from aid. Hannibal never successfully received any significant reinforcements from Carthage. Despite his many pleas, Carthage only ever sent reinforcements successfully to Hispania. This lack of reinforcements prevented Hannibal from decisively ending the conflict by conquering Rome through force of arms. The Roman army under Quintus Fabius Maximus Verrucosus intentionally deprived Hannibal of open battle in Italy for the rest of the war, while making it difficult for Hannibal to forage for supplies. Nevertheless, Rome was also incapable of bringing the conflict in the Italian theatre to a decisive close. Not only did Roman legions contend with Hannibal in Italy and with Hannibal's brother Hasdrubal in Hispania, but Rome had embroiled itself in yet another foreign war, the first of its Macedonian wars against Carthage's ally Philip V, at the same time. Through Hannibal's inability to take strategically important Italian cities, through the general loyalty Italian allies showed to Rome, and through Rome's own inability to counter Hannibal as a master general, Hannibal's campaign continued in Italy inconclusively for sixteen years. Though he managed to sustain his forces for 15 years, Hannibal did so only by ravaging farm-lands, keeping his army healthy, which brought anger among the Romans' subject states. Realizing that Hannibal's army was outrunning its supply lines quickly, Rome took countermeasures against Hannibal's home base in Africa by sea command and stopped the flow of supplies. Hannibal quickly turned back and rushed to home defense, but suffered defeat in the Battle of Zama (202 BC). In Hispania, a young Roman commander, Publius Cornelius Scipio (later to be given the agnomen Africanus because of his feats during this war), eventually defeated the larger but divided Carthaginian forces under Hasdrubal and two other Carthaginian generals. Abandoning Hispania, Hasdrubal moved to bring his mercenary army into Italy to reinforce Hannibal, but never made it and was defeated by Roman forces near the Alps. The Third Punic War (149–146 BC) involved an extended siege of Carthage, ending in the city's thorough destruction. The resurgence of the struggle can be explained by growing anti-Roman agitations in Hispania and Greece, and the visible improvement of Carthaginian wealth and martial power in the fifty years since the Second War. With no military, Carthage suffered raids from its neighbor Numidia. Under the terms of the treaty with Rome, such disputes were arbitrated by the Roman Senate. Because Numidia was a favored client state of Rome, Roman rulings were slanted heavily in favor of the Numidians. After some fifty years of this condition, Carthage had managed to discharge its war indemnity to Rome, and considered itself no longer bound by the restrictions of the treaty, although Rome believed otherwise. Carthage mustered an army to repel Numidian forces. It immediately lost the war with Numidia, placing itself in debt yet again, this time to Numidia. This new-found Punic militarism alarmed many Romans, including Cato the Elder who, after a voyage to Carthage, ended all his speeches, no matter what the topic, by saying: "Ceterum censeo Carthaginem esse delendam" – "And I also think that Carthage must be destroyed". In 149 BC, in an attempt to draw Carthage into open conflict, Rome made a series of escalating demands, one being the surrender of three hundred children of the nobility as hostages, and finally ending with the near-impossible demand that the city be demolished and rebuilt away from the coast, deeper into Africa. When the Carthaginians refused this last demand, Rome declared the Third Punic War. Having previously relied on mercenaries to fight their wars for them, the Carthaginians were now forced into a more active role in the defense of their city. They made thousands of makeshift weapons in a short time, even using women's hair for catapult strings, and were able to hold off the initial Roman attack. A second offensive under the command of Scipio Aemilianus resulted in a three-year siege before he breached the walls, sacked the city, and systematically burned Carthage to the ground in 146 BC. When the war ended, the remaining 50,000 Carthaginians, a small part of the original pre-war population, were sold into slavery by the victors – the normal fate in antiquity of inhabitants of sacked cities. Carthage was systematically burned for 17 days; the city's walls and buildings were utterly destroyed. The remaining Carthaginian territories were annexed by Rome and reconstituted to become the Roman province of Africa. After Rome emerged as victorious, significant Carthaginian settlements, such as those in Mauretania, were taken over and aggrandized by the Romans. Volubilis, for example, was an important Roman town situated near the westernmost border of the Roman conquests. It was built on the site of the previous Carthaginian settlement that overlies an earlier neolithic habitation. ^ Chris Scarre, "The Wars with Carthage," The Penguin Historical Atlas of Ancient Rome (London: Penguin Books, 1995), 24–25. ^ Sidwell, Keith C; Jones, Peter V (1997). The world of Rome: an introduction to Roman culture. Cambridge University Press. p. 16. ISBN 978-0-521-38600-5. ^ Fagan, Garret G. The History of Ancient Rome. Lecture 13: "The Second Punic War". Teaching Company, "Great Courses" series. ^ Eckstein, Arthur M. Mediterranean Anarchy, Interstate War, and the Rise of Rome University of California Press (2009) ISBN 978-0-520-25992-8, p. 167. ^ a b Pollard, Elizabeth (2015). Worlds Together Worlds Apart. W.W. Norton & Company. p. 249. ISBN 978-0-393-92207-3. ^ a b "The Romans: From Village to Empire: A History of Rome from Earliest Times to the End of the Western Empire" by M. Boatwright, et al. 2nd edition. 2011. Wikimedia Commons has media related to Punic Wars. Bagnall, Nige (1990). The Punic Wars. London: Hutchinson. ––– (2003). The Punic Wars 264–146 BC. New York: Routledge. Hoyos, B.D. (2011). A Companion to the Punic Wars. Malden, MA: Wiley-Blackwell. Miles, Richard (2011). Carthage must be destroyed: The rise and fall of an ancient superpower. New York: Viking.